Imagine a breezy day on your screened porch, or a cozy sunroom where you can dine, lounge, or bask in the beauty of your surroundings. 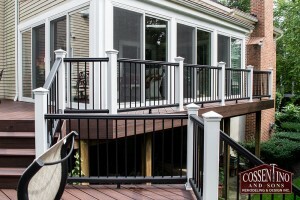 Cossentino and Sons has been building sunrooms and screened porches for more than 30 years, and we can bring that experience and professionalism to your project. We begin each project with a meeting to discuss your vision and provide you with the insight that is a result of three decades in the contracting business. Upon completion of the meeting, our owner will create an accurate proposal for your review. Once the budget is established from the proposal, we can then enter into the sunroom or screened porch design stage, which is taken care of by our architect who works closely with you, the homeowner. Construction will begin after you have approved the plans. Our work crews are managed by industry veterans who are dedicated to making sure every project is completed on time and on budget. The owner of Cossentino and Sons stays in constant communication with each crew, and will also be available to answer any of your questions throughout the building process. Your new sunroom or screened porch designed by Cossentino and Sons will introduce extra recreational space, sunlight, and air into your home. 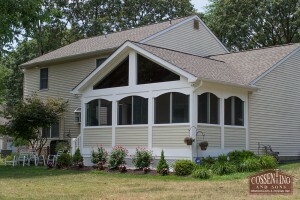 The exterior structure will blend beautifully with the original structure and design of your home. Cossentino and Sons is based in Howard County and we service customers in Baltimore, Carroll, and Anne Arundel counties, along with parts of Northern Montgomery County. If you want a sunroom or screened in porch, and are interested in working with experienced professionals who pay attention to detail, contact us today at (410) 442-0000 or email us today.